Robert Saunders Autographs Pty Ltd are now member of the local chamber of commerce, contributing in industry events and supporting local businesses. 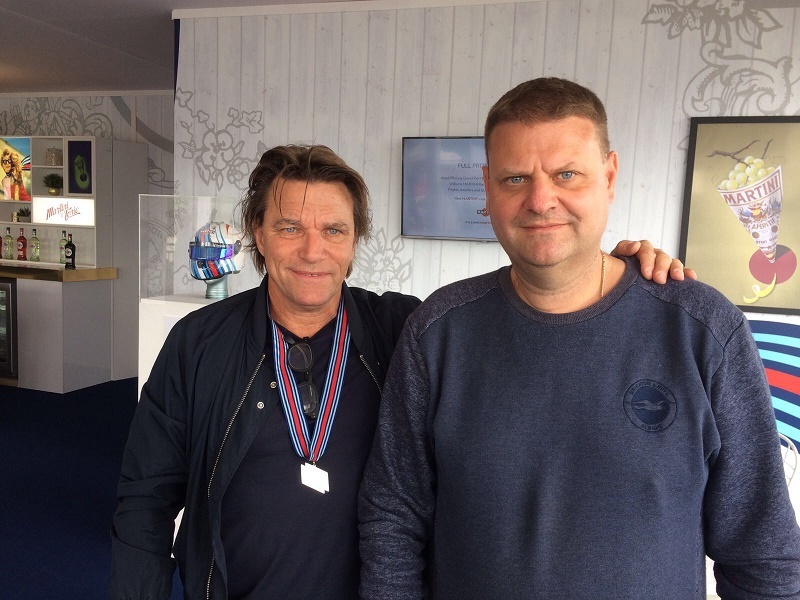 Robert caught up with Acquaintance Stefan Johansson at the 2017 Goodwood Festival of Speed. They discussed Cars, Watches, the state of F1 and Indycar. Always good to catch up with legends of the sport. We are in the process of developing a new Tablet friendly website. Watch this space. 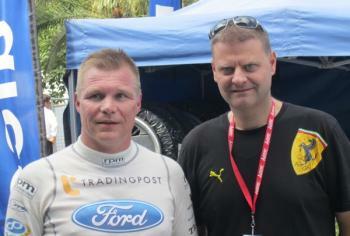 Robert once again visits the WRC Rally Championship in Coffs Harbour, Australia. The rally was dominated by Volkswagen, with a 1-2-3 for the German team. Robert got to meet several of the drivers including Sebastian Ogier, Jari Mati Latvala, Thierry Neuville, Robert Kubica, Hayden Paddon, Andreas Mikkelsen and Kris Meeke. Once again, it was a great event and allowed spectators to get up close and personal. Anna got to meet Jamie Whincup at a store opening in Queensland Australia. 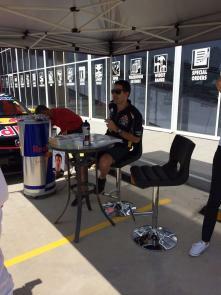 Whincup, the Redbull V8 Supercar driver, was on hand to sign autographs and speak with visitors in the Sun. 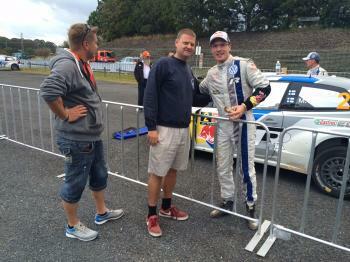 Robert visited the World Rally Championship event at Coffs Harbour, Australia. 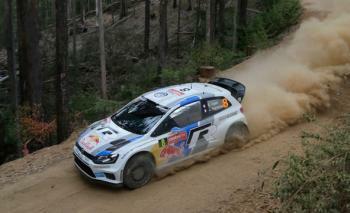 The VW of Sebastian Ogier was dominant and took the victory. Several drivers were around in the evenings and relaxed about meeting the fans. 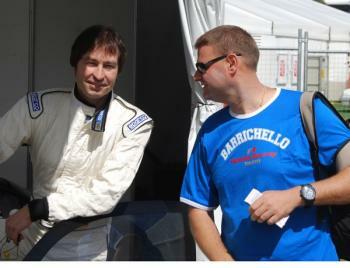 Robert meets Heinz Harold Frentzen at the Australian GP 2012. Robert met Mika Salo at the Gold Coast 600 in Surfers Paradise Australia. Salo, driving the Ford Falcon V8 came home 2nd in one of the races , putting in a master performance. 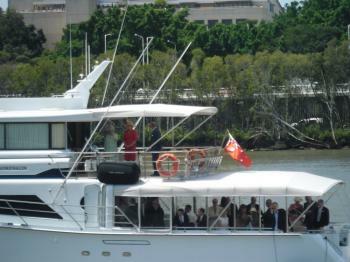 The Queen visits Brisbane Australia – Unfortunately she never took up our invite for Tea so we failed to get her autograph. Nonetheless, it was good she came. We became aware in July 2011, a dealer in the USA going under the name Autographs America www.autographsamerica.com have been forging autographs and using my name on their Certificates of Authenticity. We have no association with this company and haver never provided COAs for other companies. 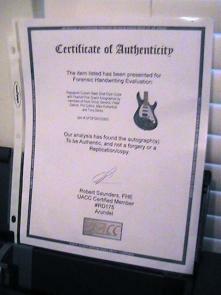 An example of one of their Forged COAs, this one associated with a signed Guitar, is enclosed. Arundel Autograph Gallery are awarded the prestigious Universal Autograph Dealers Club (UACC) “Dealer of the Year” Award. 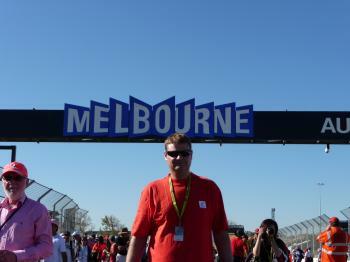 Robert attended the Australian GP over three days, taking in the atmosphere and surprise result. It was good to Jenson Button win in the Australian Sun, having followed his career from his younger days in the UK. 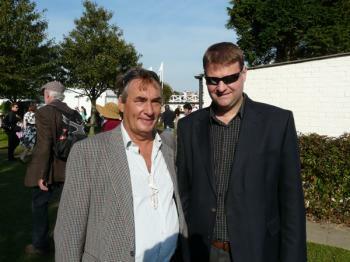 Robert meets former Formula One Racing Driver Rupert Keegan at the Goodwood Revival, England. 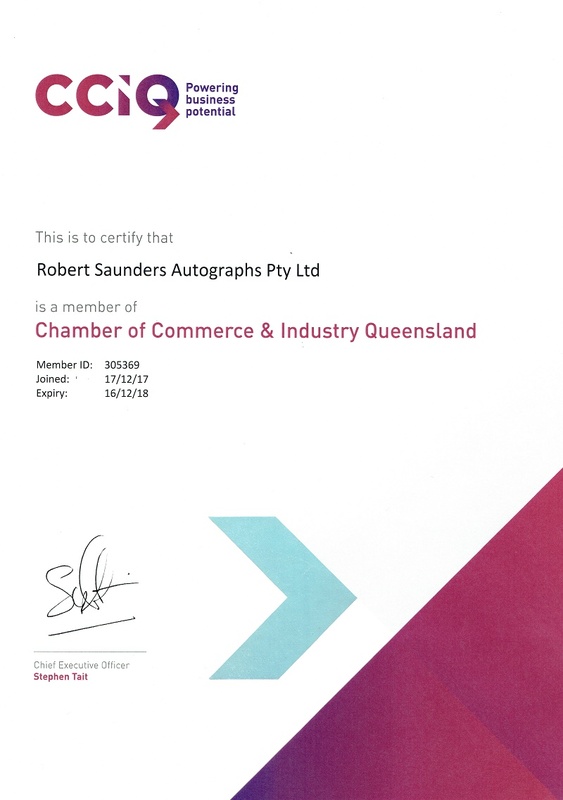 Robert attends the Darwin V8 Supercar Race, collecting autographs from the Southern Hemisphere. 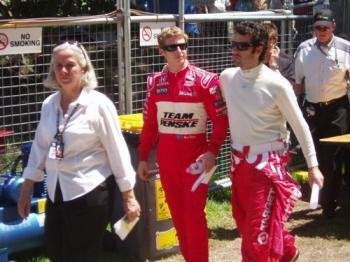 Robert attends the Gold Coast Indy Car race, won by local hero Ryan Briscoe (pictured below with Dario Franchitti). The weather in Surfers Paradise was typically superb. Paying just 10 UK Pounds for a pit pass he managed to meet several drivers and Bobby Rahal, there supporting his son Graham. The Australian Supercar Championship was also held at the same event attracting huge attention from the local crowd. 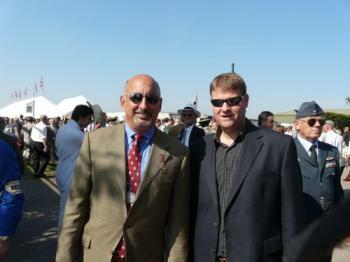 Flying in from Australia, Robert attended the Goodwood Revival once again. 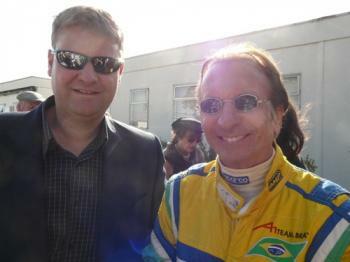 Several veteran drivers attended and we were fortunate to meet with Emerson Fittipaldi (pictured), David Brabham, Rupert Keegan, Bobby Rahal and Jean-Marc Gounon. The event, in glorious weather, proved popular with visitors from across the World. August 2008 – New Internet Site Launched. We are proud to launch our new company internet site, building upon the strengths of our previous design. Our new site offers a user friendly interface. We welcome feedback. The site will be developed further over time so we ask for your patience during this process. After a short spell in Anna’s native country of Sweden, Arundel Autograph Gallery has now successfully relocated to Australia. Business continues to grow globally and the relocation will have no impact on our service to customers. 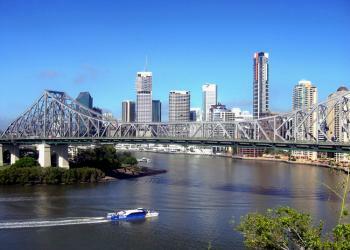 If you visit Brisbane why not drop us a visit. You are welcome. Arundel Autograph Gallery visits the Goodwood Revival once again for more automotive celebrity sightings. The weather spoiled the autograph collecting but non the less it was good to see such a great gathering of drivers once again. The photograph below shows Robert with Bobby Rahal. Robert visits New Zealand and takes in lunch in Christchurch with Eoin Young. Eoin was Bruce Mclaren’s secretary and has written numerous books on motorsport personalities, including countrymen Chris Amon and Bruce himself. 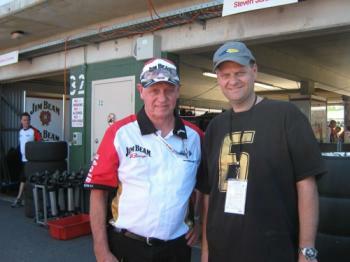 He is currently working on a book on 1967 World Champion Denny Hulme. 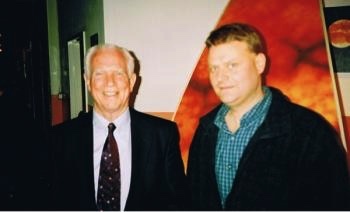 It was also a chance to meet long time enthusiast and friend John Turnbull. 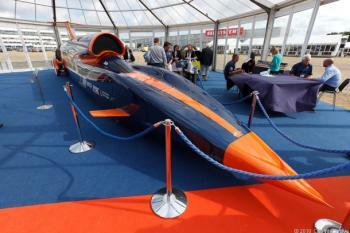 Arundel Autograph Gallery visits the Goodwood Festival of Speed for more automotive celebrity sightings. This year had a feast of current and vintage drivers such as Stirling Moss as well as several rally stars. Robert visits the Geneva Motor show to view the latest road going machinery as well as looking out for celebrity visitors. Horatio Pagani of “Zonda” and “Christian Von Koenigsegg” both attended. 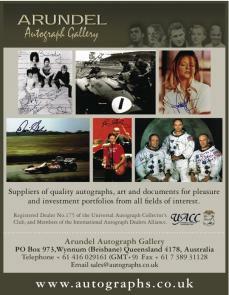 Arundel Autograph Gallery begins advertising in Car magazine `EVO`, with a quarter page colour advert. Let’s hope it is successful and compliments our other advertising in the Pen and Quill and Motorsport magazine. 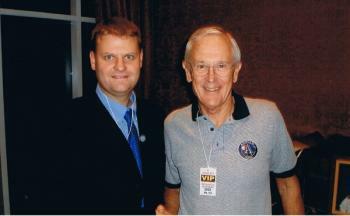 Robert was lucky enough to meet Apollo 16 Astronaut and Moonwalker Charles Duke for the 2nd time. The first time we met Duke was in Chichester, when Duke was a guest of watchmaker Omega. This time, again at the Radisson Edwardian Hotel, London, Duke was on hand to sign autographs and talk about his career and answer questions. 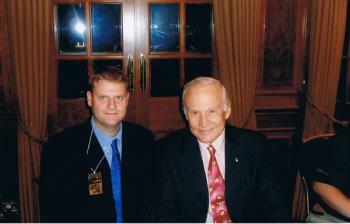 On the 28th October 2005 Robert was lucky enough to meet Edwin `Buzz` Aldrin at the Radisson Edwardian Hotel, London. Robert, among with 20 other lucky people, had dinner with Dr Aldrin and his wife in the evening and listened to Buzz talk about his career, the future of space flight and many other interesting topics. 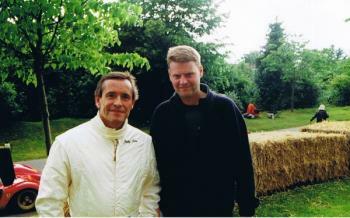 July 2005 – Robert attends the Goodwood Festival of Speed for some autograph hunting. As normal, the Goodwood Festival of Speed offered the chance to meet and talk to many motorsport celebrities, as well as the opportunity for some good autograph hunting. See you there in 2006 for some more celebrity sightings. Below is a photo of Robert with Eddie Irvine. May 2005 – ‘Is It Real’ Website launched. 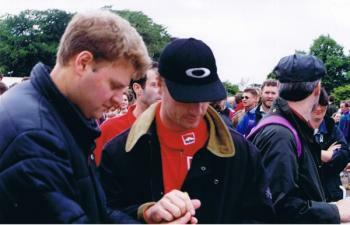 Robert and Anna walked the Albert Park race circuit just prior to the 2005 Australian Grand Prix and soak up the mood in the city of Melbourne, keeping an eye open for autograph opportunities. Once again Arundel Autograph Gallery sponsor racing driver Katie Croucher in her pursuit to become one of Britain’s fastest female drivers. 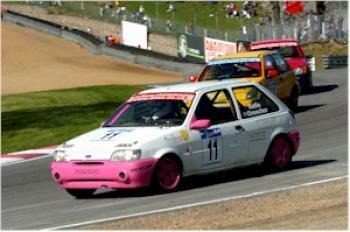 Katie has raced in a variety of cars across the UK including the Citroen 2CV, Ford Fiesta and Renault Clio. 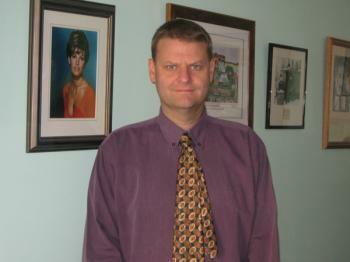 2005 – Robert Meets Dr Who ! 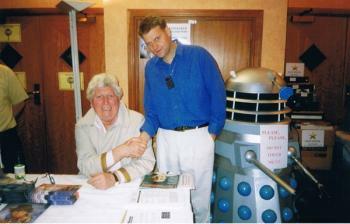 Robert was fortunate to meet Tom Baker, former Doctor Who (and a Darlek) at an event in the UK. Robert and his friends visit the Barcelona F1 circuit for the annual test session and get the chance to meet several top F1 drivers including Juan Montoya, Christian Klien Jenson Button, Antonio Pizzonia , Mark Webber, Vitantonio Liuzzi and Takuma Sato. Apart from Montoya who was once again a difficult, most obliged with an autograph. Astronaut and Moonwalker David Scott visits the Royal Greenwich Observatory, England, to talk about his career and sign his new book, `Two sides of the Moon`. Robert has the opportunity to meet him afterwards. 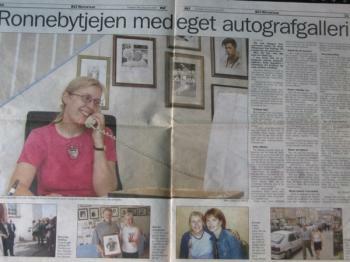 Arundel Autograph Gallery are featured in a Swedish Newspaper “Blekinge Lans Tidning” over the centre pages in an article by Jan Soderind. 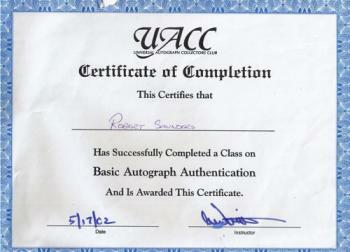 Robert attended the Basic Autograph Authentication course held at the Moat House Hotel, Northampton, England, held by UACC Director Al Wittnebert. 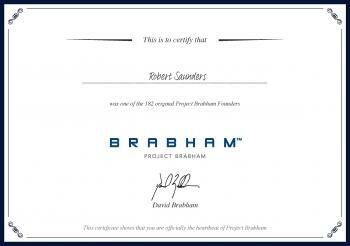 The course confirmed our approach to authentication and was an enjoyable and well set out event..